For the 1968 radio remake, see The War of the Worlds (radio 1968). "The War of the Worlds" is an episode of the American radio drama anthology series The Mercury Theatre on the Air directed and narrated by actor and future filmmaker Orson Welles as an adaptation of H. G. Wells's novel The War of the Worlds (1898). It was performed and broadcast live as a Halloween episode at 8 p.m. on Sunday, October 30, 1938, over the Columbia Broadcasting System radio network. The episode became famous for causing panic among its listening audience, though the scale of that panic is disputed, as the program had relatively few listeners. The one-hour program began with the theme music for the Mercury Theatre on the Air and an announcement that the evening's show was an adaptation of The War of the Worlds. Orson Welles then read a prologue which was closely based on the opening of H.G. Wells' novel but modified to place the story's setting in 1939. The next half hour of the broadcast was presented as typical evening of radio programming being interrupted by a series of news bulletins. The first few bulletins cut into a program of dance music and describe a series of odd explosions observed on Mars. This is followed by a seemingly unrelated report of an unusual object falling on a farm in Grover's Mill, New Jersey. Another brief musical interlude is interrupted by a live report from Grover's Mill, where police officials and a crowd of curious onlookers have surrounded the strange cylindrical object which has fallen from the sky. The situation quickly escalates when Martians emerge from the cylinder and attack using a heat-ray, abruptly cutting off the shouting of the panicked reporter at the scene. This is followed by a rapid series of increasingly alarming news updates detailing a devastating alien invasion taking place around the world and the futile efforts of the U.S. military to stop it. The first portion of the show climaxes with another live report describing giant Martian war machines releasing clouds of poisonous smoke across New York City, after which the program took its first break. During the second half of the show, the style shifts to a more conventional radio drama format and follows a survivor dealing with the aftermath of the invasion and the ongoing Martian occupation of Earth. As in the original novel, the story ends with the discovery that the Martians have been defeated by microbes rather than by humans. In the days after the adaptation, widespread outrage was expressed in the media. The program's news-bulletin format was described as deceptive by some newspapers and public figures, leading to an outcry against the broadcasters and calls for regulation by the Federal Communications Commission. Nevertheless, the episode secured Welles's fame as a dramatist. "The War of the Worlds" was the 17th episode of the CBS Radio series The Mercury Theatre on the Air, which was broadcast at 8 pm ET on Sunday, October 30, 1938.:390, 394 H. G. Wells' original novel tells the story of a Martian invasion of Earth. The novel was adapted for radio by Howard Koch, who changed the primary setting from 19th-century England to the contemporary United States, with the landing point of the first Martian spacecraft changed to rural Grover's Mill, an unincorporated village in West Windsor Township, New Jersey. The program's format was a simulated live newscast of developing events. The first two-thirds of the hour-long play is a contemporary retelling of events of the novel, presented as news bulletins interrupting programs of dance music. "I had conceived the idea of doing a radio broadcast in such a manner that a crisis would actually seem to be happening," Welles later said, "and would be broadcast in such a dramatized form as to appear to be a real event taking place at that time, rather than a mere radio play." This approach was similar to Ronald Knox's radio hoax Broadcasting the Barricades, about a riot overtaking London, that was broadcast by the BBC in 1926, which Welles later said gave him the idea for "The War of the Worlds". [a] A 1927 drama aired by Adelaide station 5CL depicted an invasion of Australia via the same techniques and inspired reactions similar to those of the Welles broadcast. The cast of characters of "The War of the Worlds" appears in order as first heard in the broadcast. The radio program begins as a simulation of a normal evening radio broadcast featuring a weather report and music by "Ramon Raquello and His Orchestra" live from a local hotel ballroom. After a few minutes, the music begins to be interrupted by several news flashes about strange gas explosions on Mars. An interview is arranged with reporter Carl Phillips and Princeton-based Professor of Astronomy Richard Pierson, who dismisses speculation about life on Mars. The musical program returns temporarily but is interrupted again by news of a strange meteorite landing in Grover's Mill, New Jersey. Phillips and Pierson are dispatched to the site, where a large crowd has gathered. Philips describes the chaotic atmosphere around the strange cylindrical object, and Pierson admits that he does not know exactly what it is, but that it seems to be made of an extraterrestrial metal. The cylinder unscrews, and Phillips describes the tentacled, horrific "monster" that emerges from inside. Police officers approach the Martian waving a flag of truce, but the invaders respond by firing a heat ray, which incinerates the delegation and ignites the nearby woods and cars as the crowd screams. Phillips's shouts about incoming flames are cut off mid-sentence, and after a moment of dead air, an announcer explains that the remote broadcast was interrupted due to "some difficulty with our field transmission." After a brief "piano interlude", regular programming breaks down as the studio struggles with casualty and fire-fighting updates. A shaken Pierson speculates about Martian technology. The New Jersey state militia declares martial law and attacks the cylinder; a captain from their field headquarters lectures about the overwhelming force of properly-equipped infantry and the helplessness of the Martians, until a tripod rises from the pit. The tripod obliterates the militia, and the studio returns, now describing the Martians as an invading army. Emergency response bulletins give way to damage and evacuation reports as thousands of refugees clog the highways. Three Martian tripods from the cylinder destroy power stations and uproot bridges and railroads, reinforced by three others from a second cylinder that landed in the Great Swamp near Morristown, as gas explosions continue. The Secretary of the Interior addresses the nation. A live connection is established to a field artillery battery in the Watchung Mountains. Its gun crew damages a machine, resulting in a release of poisonous black smoke, before fading into the sound of coughing. The lead plane of a wing of bombers from Langham Field broadcasts its approach and remains on the air as their engines are burned by the heat ray and the plane dives on the invaders. Radio operators go active and fall silent. Although the bombers manage to destroy one machine, the remaining five are spreading black smoke across the Jersey Marshes into Newark. Eventually, a news reporter, broadcasting from atop the Broadcasting Building, describes the Martian invasion of New York City – "five great machines" wading the Hudson "like [men] wading through a brook", black smoke drifting over the city, people diving into the East River "like rats", others in Times Square "falling like flies". He reads a final bulletin stating that Martian cylinders have fallen all over the country, then describes the smoke approaching down the street until he has a coughing fit and falls silent, leaving only the sounds of the city under attack in the background. Finally, a ham radio operator is heard calling, "2X2L calling CQ, New York. Isn't there anyone on the air? Isn't there anyone on the air? Isn't there... anyone?" You are listening to a CBS presentation of Orson Welles and the Mercury Theatre of the Air, in an original dramatization of The War of the Worlds by H. G. Wells. The performance will continue after a brief intermission. The last third of the program is a monologue and dialogue. Professor Pierson, having survived the attack on Grover's Mill, attempts to make contact with other humans. In Newark, he encounters an opportunistic militiaman who holds fascist ideals in regards to man's relationship with the Martians, and intends to use Martian weaponry to take control of both species. Declaring that he wants no part of "his world", Pierson leaves the stranger with his delusions. His journey takes him to the ruins of New York, where he discovers that the Martians have died – as with the novel, they fell victim to earthly pathogenic germs, to which they had no immunity. Life eventually returns to normal, and Pierson finishes writing his recollections of the invasion and its aftermath. "In the first place, most people didn't hear the show." NBC Red Network, carried The Chase and Sanborn Hour with Edgar Bergen and Charlie McCarthy. according to Hooper Ratings, the most popular national program of 1938. NBC Blue Network, carried "Out of the West," with Ernest Gill and his Orchestra, from San Francisco. Mutual Broadcasting System, carried WOR Symphony, Alfred Wallenstein, conductor. Colonial Network, in New England, carried Father Coughlin's paid program. Actor Stefan Schnabel recalled sitting in the anteroom after finishing his on-air performance. "A few policemen trickled in, then a few more. Soon, the room was full of policemen and a massive struggle was going on between the police, page boys, and CBS executives, who were trying to prevent the cops from busting in and stopping the show. It was a show to witness." Future Tonight Show host Jack Paar had announcing duties that night for Cleveland CBS affiliate WGAR. As panicked listeners called the studio, Paar attempted to calm them on the phone and on air by saying: "The world is not coming to an end. Trust me. When have I ever lied to you?" When the listeners started charging Paar with "covering up the truth", he called WGAR's station manager for help. Oblivious to the situation, the manager advised Paar to calm down and said that it was "all a tempest in a teapot". In a 1975 interview with radio historian Chuck Schaden, radio actor Alan Reed recalled being one of several actors recruited to answer phone calls at CBS's New York headquarters. In Concrete, Washington, phone lines and electricity suffered a short circuit at the Superior Portland Cement Company's substation. Residents were unable to call neighbors, family, or friends to calm their fears. Reporters who heard of the coincidental blackout sent the story over the newswire, and soon, Concrete was known worldwide. Question: Were you aware of the terror such a broadcast would stir up? Welles: Definitely not. The technique I used was not original with me. It was not even new. I anticipated nothing unusual. Question: Should you have toned down the language of the drama? Welles: No, you don't play murder in soft words. Question: Why was the story changed to put in names of American cities and government officers? In its editions of October 31, 1938, the Tucson Citizen reported that three Arizona affiliates of CBS (KOY in Phoenix, KTUC in Tucson and KSUN in Bisbee) had originally scheduled a delayed broadcast of "The War of the Worlds" that night; CBS had shifted The Mercury Theater on the Air from Monday nights to Sunday nights on September 11, but the three affiliates preferred to keep the series in its original Monday slot so that it would not compete with NBC's top-rated Chase and Sanborn Hour. However, late on that Sunday night, CBS contacted KOY and KTUC owner Burridge Butler and instructed him not to air the program the following night. Within three weeks, newspapers had published at least 12,500 articles about the broadcast and its impact,:61 but the story dropped from the front pages after a few days. Adolf Hitler referenced the broadcast in a speech in Munich on November 8, 1938.:161 Welles later remarked that Hitler cited the effect of the broadcast on the American public as evidence of "the corrupt condition and decadent state of affairs in democracy". Bob Sanders recalled looking outside the window and seeing a traffic jam in the normally quiet Grover's Mill, New Jersey, a crossroads of Cranbury and Clarksville Roads. Later studies indicate that many missed the repeated notices about the broadcast being fictional, partly because The Mercury Theatre on the Air, an unsponsored CBS cultural program with a relatively small audience, ran at the same time as the NBC Red Network's popular Chase and Sanborn Hour featuring ventriloquist Edgar Bergen. At the time, many Americans assumed that a significant number of Chase and Sanborn listeners changed stations when the first comic sketch ended and a musical number by Nelson Eddy began and then tuned in "The War of the Worlds" after the opening announcements, but historian A. Brad Schwartz, after studying hundreds of letters from people who heard "The War of the Worlds", as well as contemporary audience surveys, concluded that very few people frightened by Welles's broadcast had tuned out Bergen's program. "All the hard evidence suggests that The Chase & Sanborn Hour was only a minor contributing factor to the Martian hysteria," he wrote. "... in truth, there was no mass exodus from Charlie McCarthy to Orson Welles that night. ":67–69 Because the broadcast was unsponsored, Welles and company could schedule breaks at will, rather than arranging them around advertisements. As a result, the only notices that the broadcast was fictional came at the start of the broadcast and about 40 and 55 minutes into it. "The supposed panic was so tiny as to be practically immeasurable on the night of the broadcast. ... Radio had siphoned off advertising revenue from print during the Depression, badly damaging the newspaper industry. So the papers seized the opportunity presented by Welles’ program to discredit radio as a source of news. The newspaper industry sensationalized the panic to prove to advertisers, and regulators, that radio management was irresponsible and not to be trusted." Historical research suggests the panic was far less widespread than newspapers had indicated at the time. "[T]he panic and mass hysteria so readily associated with 'The War of the Worlds' did not occur on anything approaching a nationwide dimension", American University media historian W. Joseph Campbell wrote in 2003. He quotes Robert E. Bartholomew, an authority on mass panic outbreaks, as having said that "there is a growing consensus among sociologists that the extent of the panic... was greatly exaggerated". Five thousand households were telephoned that night in a survey conducted by the C. E. Hooper company, the main radio ratings service at the time. Only 2% of the respondents said they were listening to the radio play, and no one stated they were listening to a news broadcast. About 98% of respondents said they were listening to other radio programming (The Chase and Sanborn Hour was by far the most popular program in that timeslot) or not listening to the radio at all. Further shrinking the potential audience, some CBS network affiliates, including some in large markets such as Boston's WEEI, had pre-empted The Mercury Theatre on the Air, in favor of local commercial programming. Ben Gross, radio editor for the New York Daily News, wrote in his 1954 memoir that the streets were nearly deserted as he made his way to the studio for the end of the program. Producer John Houseman reported that the Mercury Theatre staff was surprised when they were finally released from the CBS studios to find life going on as usual in the streets of New York. :404 The writer of a letter that The Washington Post published later likewise recalled no panicked mobs in the capital's downtown streets at the time. "The supposed panic was so tiny as to be practically immeasurable on the night of the broadcast", media historians Jefferson Pooley and Michael Socolow wrote in Slate on its 75th anniversary in 2013; "Almost nobody was fooled". According to Campbell, the most common response said to indicate a panic was calling the local newspaper or police to confirm the story or seek additional information. That, he writes, is an indicator that people were not generally panicking or hysterical. "The call volume perhaps is best understood as an altogether rational response..." Some New Jersey media and law enforcement agencies received up to 40% more telephone calls than normal during the broadcast. What a night. After the broadcast, as I tried to get back to the St. Regis where we were living, I was blocked by an impassioned crowd of news people looking for blood, and the disappointment when they found I wasn't hemorrhaging. It wasn't long after the initial shock that whatever public panic and outrage there was vanished. But, the newspapers for days continued to feign fury. As it was late on a Sunday night in the Eastern Time Zone, where the broadcast originated, few reporters and other staff were present in newsrooms. Most newspaper coverage thus took the form of Associated Press stories, which were largely anecdotal aggregates of reporting from its various bureaus, giving the impression that panic had indeed been widespread. Many newspapers led with the Associated Press's story the next day. The Twin City Sentinel of Winston-Salem, North Carolina pointed out that the situation could have been even worse if most people had not been listening to Edgar Bergen's show: "Charlie McCarthy last night saved the United States from a sudden and panicky death by hysteria." On November 2, 1938, the Australian newspaper The Age characterized the incident as "mass hysteria" and stated that "never in the history of the United States had such a wave of terror and panic swept the continent". Unnamed observers quoted by The Age commented that "the panic could have only happened in America." Editorialists chastised the radio industry for allowing that to happen. The response may have reflected newspaper publishers' fears that radio, to which they had lost some of the advertising revenue that was scarce enough during the Great Depression, would render them obsolete. In "The War of the Worlds," they saw an opportunity to cast aspersions on the newer medium: "The nation as a whole continues to face the danger of incomplete, misunderstood news over a medium which has yet to prove that it is competent to perform the news job," wrote Editor & Publisher, the newspaper industry's trade journal. William Randolph Hearst's papers called on broadcasters to police themselves, lest the government step in, as Iowa Senator Clyde L. Herring proposed a bill that would have required all programming to be reviewed by the FCC prior to broadcast (he never actually introduced it). Others blamed the radio audience for its credulity. Noting that any intelligent listener would have realized the broadcast was fictional, the Chicago Tribune opined, "it would be more tactful to say that some members of the radio audience are a trifle retarded mentally, and that many a program is prepared for their consumption." Other newspapers took pains to note that anxious listeners had called their offices to learn whether Martians were really attacking. Few contemporary accounts exist outside newspaper coverage of the mass panic and hysteria supposedly induced by the broadcast. Justin Levine, a producer at KFI-AM in Los Angeles, wrote in a 2000 history of the FCC's response to hoax broadcasts that "the anecdotal nature of such reporting makes it difficult to objectively assess the true extent and intensity of the panic. Bartholomew sees this as yet more evidence that the panic was predominantly a creation of the newspaper industry. In a study published in book form as The Invasion from Mars (1940), Princeton professor Hadley Cantril calculated that some six million people heard "The War of the Worlds" broadcast. :56 He estimated that 1.7 million listeners believed the broadcast was an actual news bulletin and, of those, 1.2 million people were frightened or disturbed. :58 Media historians Jefferson Pooley and Michael Socolow have since concluded, however, that Cantril's study has serious flaws. Its estimate of the program's audience is more than twice as high as any other at the time. Cantril himself conceded that, but argued that unlike Hooper, his estimate had attempted to capture the significant portion of the audience that did not have home telephones at that time. Since those respondents were contacted only after the media frenzy, Cantril allowed that their recollections could have been influenced by what they read in the newspapers. Claims that Chase and Sanborn listeners, who missed the disclaimer at the beginning when they turned to CBS during a commercial break or musical performance on that show and thus mistook "The War of the Worlds" for a real broadcast inflated the show's audience and the ensuing alleged panic, are impossible to substantiate. Apart from his admittedly-imperfect methods of estimating the audience and assessing the authenticity of their response, Pooley and Socolow found, Cantril made another error in typing audience reaction. Respondents had indicated a variety of reactions to the program, among them "excited", "disturbed", and "frightened". However, he included all of them with "panicked", failing to account for the possibility that despite their reaction, they were still aware the broadcast was staged. "[T]hose who did hear it, looked at it as a prank and accepted it that way," recalled researcher Frank Stanton. Bartholomew grants that hundreds of thousands were frightened, but calls evidence of people taking action based on their fear "scant" and "anecdotal". Indeed, contemporary news articles indicate that police were swamped with hundreds of calls in numerous locations, but stories of people doing anything more than calling authorities involved mostly only small groups. Such stories were often reported by people who were panicking themselves. Later investigations found much of the alleged panicked responses to have been exaggerated or mistaken. Cantril's researchers found that contrary to what had been claimed, no admissions for shock were made at a Newark hospital during the broadcast; hospitals in New York City similarly reported no spike in admissions that night. A few suicide attempts seem to have been prevented when friends or family intervened, but no record of a successful one exists. A Washington Post claim that a man died of a heart attack brought on by listening to the program could not be verified. One woman filed a lawsuit against CBS, but it was soon dismissed. The FCC also received letters from the public that advised against taking reprisals. Singer Eddie Cantor urged the commission not to overreact, as "censorship would retard radio immeasurably." The FCC not only chose not to punish Welles or CBS but also barred complaints about "The War of the Worlds" from being brought up during license renewals. "Janet Jackson's 2004 'wardrobe malfunction' remains far more significant in the history of broadcast regulation than Orson Welles' trickery," wrote media historians Jefferson Pooley and Michael Socolow. H. G. Wells and Orson Welles met for the first and only time in late October 1940, shortly before the second anniversary of the Mercury Theatre broadcast, when they both happened to be lecturing in San Antonio, Texas. On October 28, 1940, the two men visited the studios of KTSA radio for an interview by Charles C. Shaw,:361 who introduced them by characterizing the panic generated by "The War of the Worlds": "The country at large was frightened almost out of its wits". H.G. Wells expressed good-natured skepticism about the actual extent of the panic caused by "this sensational Halloween spree," saying: "Are you sure there was such a panic in America or wasn't it your Halloween fun?" Orson Welles appreciated the comment: "I think that's the nicest thing that a man from England could say about the men from Mars. Mr. Hitler made a good deal of sport of it, you know.... It's supposed to show the corrupt condition and decadent state of affairs in democracy, that 'The War of the Worlds' went over as well as it did. I think it's very nice of Mr. Wells to say that not only I didn't mean it, but the American people didn't mean it." When Shaw interjected that there was "some excitement" that he did not wish to belittle, Welles asked him, "What kind of excitement? Mr. H. G. Wells wants to know if the excitement wasn't the same kind of excitement that we extract from a practical joke in which somebody puts a sheet over his head and says 'Boo!' I don't think anybody believes that that individual is a ghost, but we do scream and yell and rush down the hall. And that's just about what happened." "That's a very excellent description," Shaw said. "You aren't quite serious in America, yet," said Wells. "You haven't got the war right under your chins. And the consequence is you can still play with ideas of terror and conflict.... It's a natural thing to do until you're right up against it." "Until it ceases to be a game," Welles said, a phrase that Wells repeated. Britain and France had then been at war with Nazi Germany for more than a year. Welles did seek legal redress after the CBS TV series Studio One presented its top-rated broadcast, "The Night America Trembled", on September 9, 1957. Hosted by Edward R. Murrow, the live presentation of Nelson S. Bond's documentary play recreated the 1938 performance of "The War of the Worlds" in the CBS studio, using the script as a framework for a series of factual narratives about a cross-section of radio listeners. No member of the Mercury Theatre is named. The courts ruled against Welles, who was found to have abandoned any rights to the script after it was published in Cantril's book. Koch had granted CBS the right to use the script in its program. The book, The Panic Broadcast, was first published in 1970. The best-selling album was a sound recording of the broadcast titled Orson Welles' War of the Worlds, "released by arrangement with Manheim Fox Enterprises, Inc." The source discs for the recording are unknown. Welles told Peter Bogdanovich that it was a poor-quality recording taken off the air at the time of broadcast – "a pirated record which people have made fortunes of money and have no right to play." Welles received no compensation. CBS, too, found reports ultimately useful in promoting the strength of its influence. It presented a fictionalized account of the panic in "The Night America Trembled", a 1957 episode of the television series Studio One, and included it prominently in its 2003 celebrations of CBS's 75th anniversary as a television broadcaster. "The legend of the panic," according to Jefferson and Socolow, "grew exponentially over the following years ... [It] persists because it so perfectly captures our unease with the media's power over our lives." In 1975, ABC aired the television movie The Night That Panicked America, depicting the effect the radio drama had on the public using fictional, but typical American families of the time. The New Jersey Township of West Windsor, where Grover's Mill is located, commemorated the 50th anniversary of the broadcast in 1988 with four days of festivities including art and planetarium shows, a panel discussion, a parade, burial of a time capsule, a dinner dance, film festivals devoted to H. G. Wells and Orson Welles, and the dedication of a bronze monument to the fictional Martian landings. Howard Koch, an author of the original radio script, attended the 49th anniversary celebration as an honored guest. The 75th anniversary of "The War of the Worlds" was marked by an international rebroadcast with an introduction by George Takei, and an episode of the PBS documentary series American Experience. On January 27, 2003, the Mercury Theatre broadcast of "The War of the Worlds" was one of the first 50 recordings made part of the National Recording Registry of the Library of Congress. A Spanish-language version produced in February 1949 by Leonardo Paez and Eduardo Alcaraz for Radio Quito in Quito, Ecuador, reportedly set off panic in the city. Police and fire brigades rushed out of town to engage the supposed alien invasion force. After it was revealed that the broadcast was fiction, the panic transformed into a riot. Hundreds attacked Radio Quito and El Comercio, a local newspaper that had participated in the hoax by publishing false reports of unidentified objects in the skies above Ecuador in the days preceding the broadcast. The riot resulted in at least seven deaths, including those of Paez's girlfriend and nephew. Paez moved to Venezuela after the incident. An updated version of the radio drama aired several times between 1968 and 1975 on WKBW radio in Buffalo, New York. On the 50th anniversary of the radio play, on October 30, 1988, a remake was aired, originated by WGBH, picked up by 150 National Public Radio stations, produced by Judith Walcutt of Otherworld Media, recorded outdoors at Skywalker Ranch, directed by David Ossman, who updated Howard Koch's original script, to make it sound like modern public radio, with Koch's approval and starring Jason Robards, Steve Allen, Hector Elizondo, René Auberjonois, Philip Proctor, Douglas Edwards, Scott Simon, and Terry Gross. It was nominated for a Grammy Award for Best Spoken Word or Nonmusical Recording. In 1994, L.A. Theatre Works and Pasadena, California public radio station KPCC broadcast the original play before a live audience. Most of the cast for this production had appeared in one of more incarnation of Star Trek, including Leonard Nimoy, John de Lancie, Dwight Schultz, Wil Wheaton, Gates McFadden, Brent Spiner, Armin Shimerman, Jerry Hardin, and Tom Virtue. De Lancie directed. It was accompanied by an original sequel called "When Welles Collide" co-written by de Lancie and Nat Segaloff featuring the same cast as themselves. On October 30, 2002, XM Satellite Radio collaborated with conservative talk-show host Glenn Beck for a live recreation of the broadcast, using Koch's original script and airing on October 30. The remake aired on the Buzz XM channel, as well as on Beck's AM/FM affiliates. On October 30, 2013, KPCC re-aired the show, introduced by George Takei with a documentary on the 1938 radio show's production. On November 12, 2017, a new opera based on "War of the Worlds" premiered at Walt Disney Concert Hall and outdoors in Los Angeles. The music was composed by Annie Gosfield, commissioned by the Los Angeles Philharmonic, directed by Yuval Sharon, and narrated by Sigourney Weaver. In 1982 "Warp of the Worlds" by SHOCKWAVE, out of KFAI in Minneapolis. Written by Kate Worley and Jerry Stearns. Performed live at Minicon. "They Came for The Candy", by The Radio Pirates out of Madison, WI. A half-hour produced by Scott Dikkers and written by Jay Rath. ^ Welles said, "I got the idea from a BBC show that had gone on the year before [sic] when a Catholic priest told how some Communists had seized London and a lot of people in London believed it. And I thought that'd be fun to do on a big scale, let's have it from outer space—that's how I got the idea." ^ a b c d e f g h i j k l m n o p q r Houseman, John (1972). Run-Through: A Memoir. New York: Simon & Schuster. ISBN 0-671-21034-3. ^ a b c d e f g h i j k l m n o p Pooley, Jefferson; Socolow, Michael (October 28, 2013). "The Myth of the War of the Worlds Panic". Slate. Retrieved November 1, 2013. ^ a b c d e f g h i Schwartz, A. Brad (2015). Broadcast Hysteria: Orson Welles's War of the Worlds and the Art of Fake News (1st ed.). New York: Hill and Wang. ISBN 0-8090-3161-2. ^ a b Schwartz, A. Brad (May 6, 2015). "The Infamous 'War of the Worlds' Radio Broadcast Was a Magnificent Fluke". Smithsonian.com. Smithsonian. Retrieved October 10, 2015. ^ "The BBC Radio Panic (1926)". The Museum of Hoaxes. Retrieved February 13, 2018. ^ Wilkes, David (October 12, 2011). "'Bolsheviks are attacking the Palace and Big Ben has been destroyed': The fake BBC radio bulletin that terrified listeners in 1926". Daily Mail. Retrieved February 13, 2018. ^ Welles, Orson, and Peter Bogdanovich, This is Orson Welles. HarperAudio, September 30, 1992. ISBN 1-55994-680-6 Audiotape 4A 6:25–6:42. ^ Invasion Panic This Week; Martians Coming Next, Radio Recall, April 2013. ^ Fielding, Raymond (1978). The March of Time, 1935–1951. New York: Oxford University Press. p. 13. ISBN 0-19-502212-2. ^ a b c Welles, Orson; Bogdanovich, Peter; Rosenbaum, Jonathan (1992). This is Orson Welles. New York: HarperCollins Publishers. ISBN 0-06-016616-9. ^ Ashley, Mike; Parnell, Frank H. (1985). "The Witch's Tales". In Tymn, Marshall B.; Ashley, Mike (eds.). Science fiction, fantasy, and weird fiction magazines. Westport, Conn.: Greenwood Press. pp. 742–743. ISBN 0-313-21221-X. ^ Ashley, Mike (2000). The time machines : the story of the science-fiction pulp magazines from the beginning to 1950 : the history of the science-fiction magazine. Liverpool: Liverpool University Press. pp. 104–105. ISBN 0-85323-855-3. ^ Gosling, John (2009). Waging The war of the worlds : a history of the 1938 radio broadcast and resulting panic, including the original script. Jefferson, N.C.: McFarland & Co. ISBN 0-7864-4105-4. ^ "For the Heart at Fire's Center – Paul Stewart". The Bernard Herrmann Society. Retrieved October 22, 2014. ^ "The Mercury Theatre". RadioGOLDINdex. Retrieved October 19, 2014. ^ a b "Celebrating the 70th Anniversary of Orson Welles's panic radio broadcast The War of the Worlds". Wellesnet, October 26, 2008. Retrieved October 19, 2014. ^ Treaster, Joseph B. "Dan Seymour, Ex-Announcer And Advertising Leader, Dies", The New York Times, July 29, 1982. Accessed December 3, 2017. "Mr. Seymour was the announcer who, in Orson Welles's famous 1938 radio broadcast of War of the Worlds, terrified listeners with realistic bulletins on Martian invaders." ^ Koch, Howard (1970). The Panic Broadcast: Portrait of an Event. Boston: Little, Brown and Company. ISBN 0-316-50060-7. ^ a b c d e Cantril, Hadley, Hazel Gaudet, and Herta Herzog, The Invasion from Mars: A Study in the Psychology of Panic: with the Complete Script of the Famous Orson Welles Broadcast. Princeton, N.J.: Princeton University Press, 1940. ^ "The War of the Worlds – The Script". www.sacred-texts.com. Retrieved November 3, 2018. ^ "The War of the Worlds panic was a myth". telegraph.co.uk. Retrieved November 3, 2018. ^ results, search (September 30, 1997). "Fighting for the First Amendment: Stanton of CBS vs. Congress and the Nixon White House". Praeger. Retrieved November 3, 2018 – via Amazon. ^ "Did the 1938 Radio Broadcast of 'War of the Worlds' Cause a Nationwide Panic?". snopes.com. Retrieved November 3, 2018. ^ "75 Years Ago, 'War Of The Worlds' Started A Panic. Or Did It? – WNYC – New York Public Radio, Podcasts, Live Streaming Radio, News". wnyc.org. Retrieved November 3, 2018. ^ a b c Jeff Miller. "Radio's War of the Worlds Broadcast (1938)". History of American Broadcasting. Retrieved October 28, 2014. ^ Vallance, Tom (March 25, 1999). "Obituary: Stefan Schnabel". The Independent. Retrieved March 5, 2015. ^ Brinkley, Alan (2010). "Chapter 23 – The Great Depression". The Unfinished Nation. p. 615. ISBN 978-0-07-338552-5. ^ a b Schwartz, A. Brad (April 27, 2015). "Orson Welles and History's First Viral-Media Event". VanityFair.com. Conde Nast. Retrieved October 19, 2015. ^ "Radio Listeners in Panic, Taking War Drama as Fact" (reprint). New York Times. October 31, 1938. In Newark, in a single block at Heddon Terrace and Hawthorne Avenue, more than 20 families rushed from their houses with wet handkerchiefs and towels over their faces to flee what they believed a gas raid. Some began moving household furniture. Throughout New York, families left their homes, some to near-by parks. Thousands of persons called the police, newspapers, and radio stations here and in other cities of the United States and Canada, seeking advice on protective measures against the raids. ^ a b c d e f g Campbell, W. Joseph. (2010). Getting it wrong : ten of the greatest misreported stories in American Journalism. Berkeley: University of California Press. pp. 26–44. ISBN 978-0-520-26209-6. ^ Bloomfield, Gary (2004). Duty, Honor, Applause: America's Entertainers in World War II, Part 810. Globe Pequot. p. 37. ISBN 978-1-59228-550-1. ^ KIRO listeners responsible for most famous War of the Worlds panic Archived November 2, 2011, at the Wayback Machine MyNorthwest.com. Accessed 10–31–11. ^ "George Orson Welles apologizes for the The War of the Worlds broadcast (October 31, 1938)". Dailymotion. Retrieved November 25, 2017. ^ Tucson Citizen, edition of October 31, 1938, accessed on microfilm at the Tucson Public Library. ^ "War of the Worlds Gallery" (PDF). The Mercury Theatre Radio Programs, Digital Deli. Retrieved January 12, 2014. Representative news headlines from October 31, 1938. ^ a b c d e f g h "Orson Welles and H.G. Wells". YouTube. October 28, 1940. Retrieved September 26, 2014. ^ a b "When Orson Welles Met H G Wells". Transcript. Ross Lawhead (blog), September 17, 2012. Retrieved September 26, 2014. ^ "War of the Worlds radio hoax broadcast 80 years later: When Martians attacked New Jersey". app.com. Retrieved November 3, 2018. ^ "75 Years Since "War of the Worlds" Broadcast, Hoaxes Live On". nationalgeographic.com. November 1, 2013. Retrieved November 3, 2018. ^ "photo_20091024_preparing_for_invasion – The Saturday Evening Post". www.saturdayeveningpost.com. Retrieved November 3, 2018. ^ Bartholomew, Robert E. (November – December 1998). "The Martian Panic Sixty Years Later: What Have We Learned?". Skeptical Inquirer. Retrieved January 1, 2014. ^ Tarbox, Todd (2013). Orson Welles and Roger Hill: A Friendship in Three Acts. Albany, Georgia: BearManor Media. p. 53. ISBN 1-59393-260-X. ^ Clodfelter, Tim (April 5, 2017). "Winston-Salem citizens among those fooled by radio broadcast". Winston-Salem Journal. Retrieved April 5, 2017. ^ "Mass Hysteria in U.S.A. Radio Broadcast Panic". The Age (Melbourne: 1854 – ). Vic. : Fairfax. November 2, 1938. p. 8. Retrieved March 8, 2014. ^ a b Levine, Justin; "A History and Analysis of the Federal Communication Commission's Response to Radio Broadcast Hoaxes"; 52 Fed Comm L J 2, 273–320, 278n28; March 1, 2000; retrieved November 5, 2013. ^ Bartholomew, Robert; Radford, Benjamin (2012). The Martians Have Landed! : A History of Media-driven Panics and Hoaxes. Jefferson, NC: McFarland. p. 21. ISBN 9780786464982. Retrieved November 4, 2013. ^ a b Bartholomew, Robert E. (2001). Little Green Men, Meowing Nuns and Head-Hunting Panics: A Study of Mass Psychogenic Illness and Social Delusion. Jefferson, North Carolina: Macfarland & Company. pp. 217ff. ISBN 0-7864-0997-5. ^ "I did not hear the Martians rapping on my chamber door". Letters of Note, September 9, 2009. Retrieved October 18, 2014. ^ Potter, Lee Ann (Fall 2003). ""Jitterbugs" and "Crack-pots": Letters to the FCC about the "War of the Worlds" Broadcast". Prologue. 35 (3). Retrieved November 3, 2013. ^ "Help—Men From Mars". Radio Digest. February 1939, pp. 113–127. ^ "Sentence of death, The night America trembled (DVD, 2002)". WorldCat. Retrieved October 21, 2014. ^ "The Night America Trembled". Studio One, September 8, 1957, at YouTube. Retrieved October 21, 2014. ^ "Orson Welles, Appellant, v. Columbia Broadcasting System, Inc., et al., Appellees, No. 17518" (PDF). United States Court of Appeals for the Ninth Circuit, October 3, 1962. Archived from the original (PDF) on March 4, 2016. Retrieved October 20, 2014. ^ Koch, Howard, The Panic Broadcast: Portrait of an Event. Boston: Little, Brown and Company, 1970. The radio play Invasion from Mars was now copyrighted in Koch's name (Catalog of Copyright Entries: Third Series; Books and Pamphlets, Title Index, January–June 1971, page 1866). Hadley Cantril's The Invasion from Mars, including the radio play (titled The Broadcast), was copyrighted in 1940 by Princeton University Press. ^ "War of the Worlds". WorldCat. Retrieved October 28, 2014. ^ "Orson Welles – War of the Worlds". Discogs. Retrieved October 28, 2014. The jacket front of the 1968 Longines Symphonette Society LP reads, "The Actual Broadcast by The Mercury Theatre on the Air as heard over the Columbia Broadcasting System, Oct. 30, 1938. The most thrilling drama ever broadcast from the famed HOWARD KOCH script! An authentic first edition … never before released! Complete, not a dramatic word cut! Script by Howard Koch from the famous H. G. Wells novel … featuring the most famous performance from The Mercury Theatre on the Air!" ^ Welles, Orson, and Peter Bogdanovich, This is Orson Welles. HarperAudio, September 30, 1992. ISBN 1559946806 Audiotape 4A 7:08–7:42. ^ Drew, Robert (1973). "Who's Out There?". Drew Associates. Retrieved August 19, 2016. 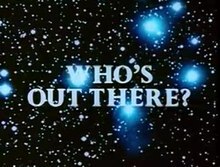 ^ "Who's Out There—Orson Welles narrates a NASA show on intelligent life in the Universe". Wellesnet. February 10, 2008. Retrieved August 19, 2016. ^ "'The War of the Worlds' at 75: Listen to it again on KPCC along with George Takei". Off-Ramp. KPCC. Retrieved October 13, 2015. ^ "PBS fall season offers an array of new series, specials and returning favorites". PBS press release, May 9, 2013. Retrieved October 29, 2013. ^ "War of the Worlds". American Experience, WGBH PBS. Retrieved October 29, 2013. 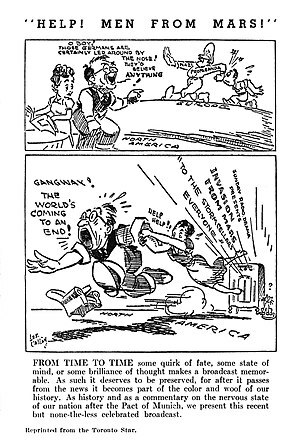 ^ "October 30th 1938 : SFFaudio". www.sffaudio.com. Retrieved November 3, 2018. ^ "War of the Worlds". Radio Lab. Season 4. Episode 3. March 7, 2008. 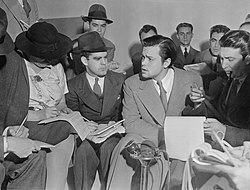 In 1949, when Radio Quito decided to translate the Orson Welles stunt for an Ecuadorian audience, no one knew that the result would be a riot that would burn down the radio station and kill at least 7 people. ^ "War of the Worlds radio broadcast, Quito (1949)". Archived from the original on May 1, 2008. Retrieved April 24, 2008. ^ "The War of the Worlds panic was a myth". The Telegraph. Retrieved May 15, 2016. ^ "Martians and Radio Quito, Ecuador (shortwave)". Don Moore. Retrieved November 3, 2018. ^ Koshinski, Bob. "WKBW's 1968 'War of the Worlds'". Buffalo Broadcasters Association. Archived from the original on September 30, 2015. Retrieved October 13, 2015. ^ "REELRADIO presents WKBW's 1971 War of the Worlds". www.reelradio.com. Retrieved November 3, 2018. ^ Michael Kernan. (October 30, 1988) THE NIGHT THE SKY FELL IN The Washington Post. ^ a b c "Great Northern Audio: Wars of the Worlds". www.greatnorthernaudio.com. Retrieved November 3, 2018. ^ Fisher, Lawrence M. (October 29, 1988). "Orson Welles's '38 Shocker Remade". The New York Times. Retrieved September 17, 2016. ^ "Grammy Awards and Nominations for 1989". Tribune Company. 1989. Archived from the original on July 4, 2007. Retrieved July 31, 2007. ^ "Broadcast To Air Sunday". Wilmington Star-News. October 29, 1988. Retrieved November 3, 2018 – via Google News Archive. The radio broadcast by Orson Welles and his Mercury Theater was so realistic, ... is presenting an "anniversary production" of the Mercury Theater radio play. ^ "Falsettos, with Michael Rupert and Chip Zien, Featured in L.A. Theatre Works Season". Playbill. Retrieved November 1, 2018. ^ L.A. Theatre Works. "A Raisin in the Sun". Skirball Cultural Center. Retrieved November 1, 2018. ^ Jadulang, V. Claire. "Foremost producer of radio theater to open season at UCLA". UCLA Newsroom. Retrieved November 1, 2018. ^ "War of the Worlds & The Lost World (mp3)". L.A. Theatre Works. August 31, 2009. Archived from the original on June 28, 2011. ^ "War of the Worlds & The Lost World". L.A. Theatre Works. August 31, 2009. Archived from the original on June 28, 2011. ^ "Articles about War Of The Worlds Radio Program – latimes". articles.latimes.com. Retrieved November 3, 2018. ^ "XM to Host Live "War of the Worlds" Re-enactment with Glenn Beck on Oct. 30". siriusxm.com. October 28, 2002. Retrieved September 17, 2016. ^ "Wellesnet interview: Glenn Beck talks about Orson Welles • Wellesnet – Orson Welles Web Resource". wellesnet.com. August 1, 2014. Retrieved November 3, 2018. ^ "How Glenn Beck Became a Mormon". ldsliving.com. June 13, 2007. Retrieved November 3, 2018. ^ "Glenn Beck's long history of vicious personal attacks". mediamatters.org. June 2, 2010. Retrieved November 3, 2018. ^ "Glenn Beck". www.facebook.com. Retrieved November 3, 2018. ^ "The making of Glenn Beck". salon.com. September 21, 2009. Retrieved November 3, 2018. ^ "Behind Glenn Beck's celebrity, a Washington state mystery". mcclatchydc.com. Retrieved November 3, 2018. ^ Radio, Southern California Public (October 9, 2013). "'The War of the Worlds' at 75: Listen to it again on KPCC along with George Takei". scpr.org. Retrieved November 3, 2018. ^ Radio, Southern California Public (October 25, 2013). "New 'War of the Worlds' doc peeks behind the scenes of the 1938 classic". scpr.org. Retrieved November 3, 2018. ^ "AES New York 2018 » Broadcast & Online Delivery Track Event B13: 80th Anniversary of The Mercury Theater's "War of the Worlds"". www.aes.org. Retrieved November 3, 2018. ^ "Review: A 'Fake News' Opera on the Streets of Los Angeles". nytimes.com. Retrieved November 1, 2018. ^ "Landing_at_Davis_Corners_IA.mp3". greatnorthernaudio.com. Retrieved November 3, 2018. Bulgatz, Joseph (1992). Ponzi Schemes, Invaders from Mars & More: Extraordinary Popular Delusions and the Madness of Crowds. New York: Three Rivers Press. ISBN 0-517-58830-7. Estrin, Mark W.; Welles, Orson (2002). Orson Welles Interviews. Jackson (Miss. ): University of Mississippi. Gosling, John (2009). Waging The War of the Worlds: A History of the 1938 Radio Broadcast and Resulting Panic. Jefferson, NC: McFarland. ISBN 0-7864-4105-4. Holmsten, Brian; Lubertozzi, Alex, eds. (2001). The Complete War of the Worlds: Mars' Invasion of Earth from H.G. Wells to Orson Welles. Naperville, IL: Sourcebooks MediaFusion. ISBN 1-570-71714-1. Schwartz, A. Brad (2015). Broadcast Hysteria: Orson Welles's War of the Worlds and the Art of Fake News. New York: Hill and Wang. ISBN 0-8090-3161-2. Wikimedia Commons has media related to The War of the Worlds (radio drama). This page was last edited on 23 April 2019, at 16:20 (UTC).